International drinking water standards like WHO Drinking Water Standards, EPA Drinking Water Standards, Indian Drinking Water Standards BIS-10500 are set by Government Organisations. 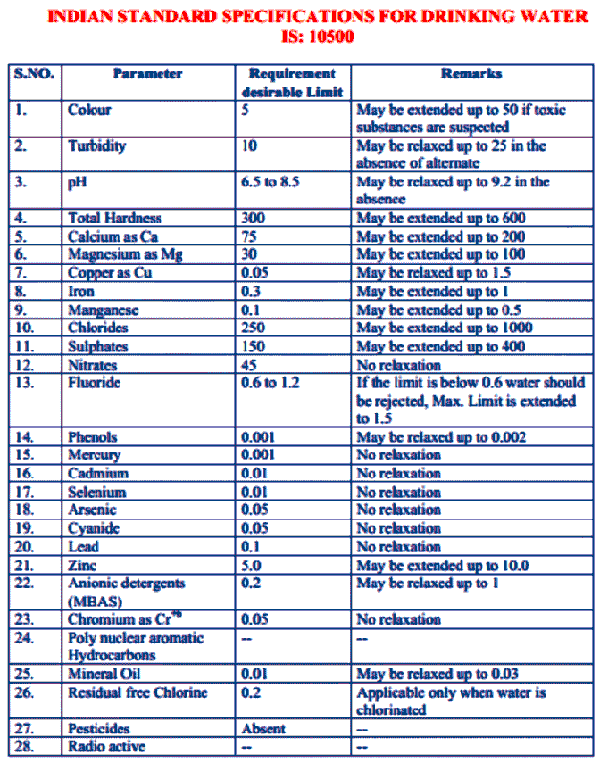 Shown below is a table of the Indian Water Quality Standards. The World Health Organisation's - WHO website has a wealth of information and those interested should visit their website. WHO's Guidelines for Drinking-water Quality was set up in Geneva in 1993. These standards are the international reference point for for drinking water standards. Here below please find a copy of the main parameters set by the Indian Drinking Water Standards authority known as the BUREAU OF INDIAN STANDARDS. The best way to buy Water Purifiers in India is to first look at all models of Water Purifiers available online at the leading online Retailers in India. For example on the online webpage of All Water Purifiers available in India on Amazon.in, you will find the full range of Indian Water Purifiers complete with their best discounted price and full specifications. This is great information, and you can decide on which model of water purifier to buy. With the model of water purifier you want to buy finalised, you can go to local shops to try and find the model of water purifier you have chosen and see if you can get at similar price of that at Amazon.in. In most cases the price from Amazon will be cheaper, because they buy in bulk from the manufacturers direct and they sell huge volumes because they are the world's largest and most trusted online retailer. If you buy from Amazon, they will arrange to have the water purifier installed in your house, usually free of charge. Warranty and other facilities offered through Amazon are usually better than what you can get from local agents of water purifiers. This is the link to our blog where you can give us feedback and post your comments. Below are links to all the pages on this website and we hope you will make full use of all the great information about Indian Water Purifiers provided here.